Some time ago, there were some rumors on the market that Samsung is working at a wearable device that is similar to Google Glass. This device was supposed to be launched later this year, but until now there wasn’t any clear information. But, a recent patent filling gives us a clearer view of what this new device is. 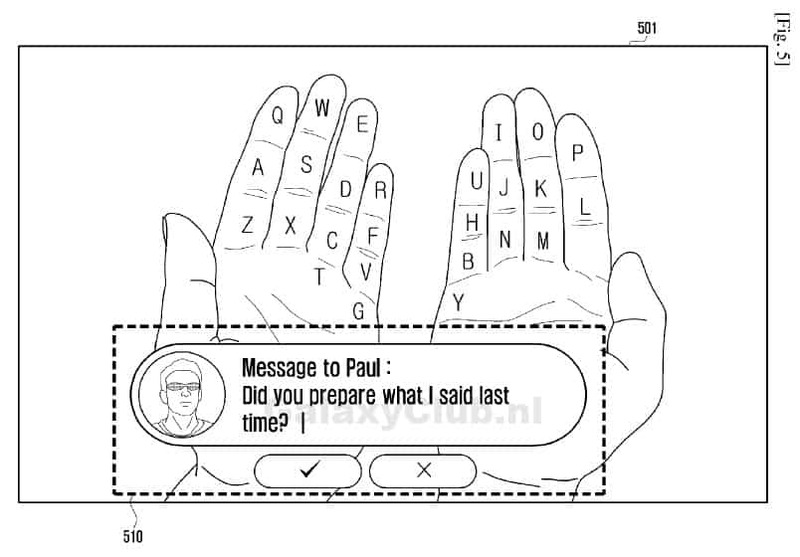 The patent shows a camera-based augmented reality keyboard that will be projected on our fingers. For different keys there are assigned different finger parts, and you can use your thumbs as input device. The camera will carry out the projection and will track your thumb movement and could be translated in words based on what parts of fingers you moved. This patent for this high tech device was filled last year at World Intellectual Property Organization and at Korean Intellectual Property Office from South Korea. This device is likely to see the light soon, but a thing is certain, that Samsung is conducting research on different ways to alternate gesture input methods. Samsung wanted to implement a voice guided actions feature, but it seems like there is more work to do until is good enough. Samsung Glass will probably be launched somewhere in the second half of 2014, why not maybe will be launched with the new Galaxy Note 4.